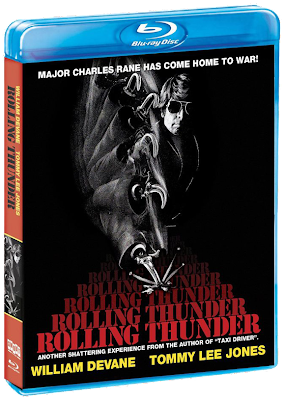 Rupert Pupkin Speaks: Shout Factorized: ROLLING THUNDER Blu-ray ""
Major Charles Rane is having a bad couple weeks. He arrives home after being a tortured P.O.W. in Hanoi for 7 years, only to find this wife ready to file for divorce(as she's met another fella) and his son quite estranged from him. Things only get worse from there. It's easy to see why Tarantino took such a shine to this film and why he even went so far as to name his(sadly short lived) distribution company after it. 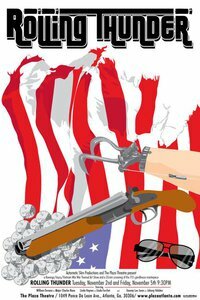 It's a pretty straightforward revenge movie at it's core. That being said, there is an earnestness to the characters that I think Tarantino really responds to. I think one of the great misunderstandings in QT's films is that a lot of people read irony where he intends no irony at all. I recall he once said of the use of TRUE ROMANCE as the title of that film that he meant it. He's a fairly non-ironic guy from what I can gather. 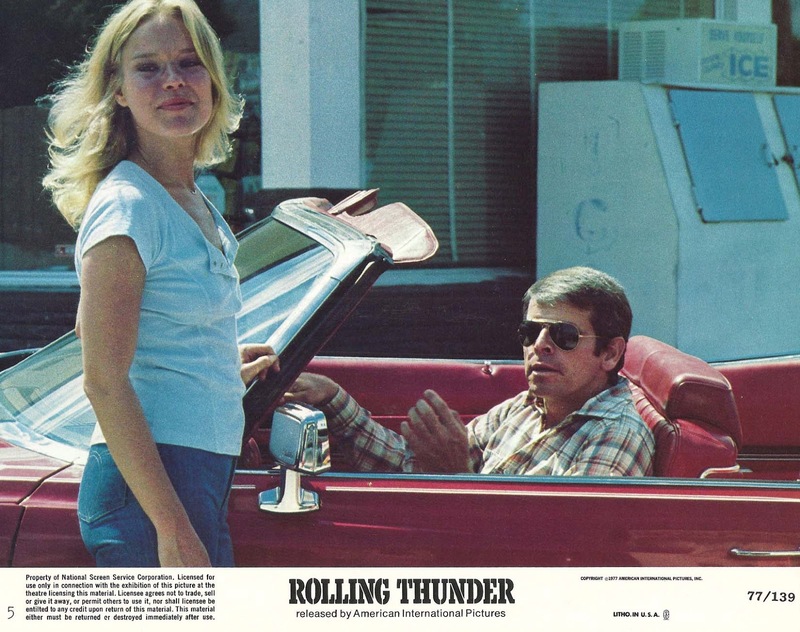 Anyway, the characters in ROLLING THUNDER have a real genuine nature to them. They are damaged, most of them, but they are really trying their best to do the right thing. In rewatching the film again for the first time in many years, I found myself much more affected by it. Could be I've gotten older and gotten sappier. Regardless, the film is a unique concoction of mean exploitation movie and somewhat heartfelt drama. I really do think that that is often what Tarantino is going for with a lot of his films. DJANGO UNCHAINED certainly has elements of both. 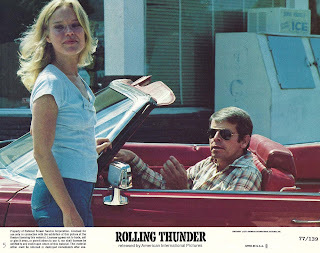 From what's conveyed in the "Making of ROLLING THUNDER" featurette on the disc(which speaks to William Devane, Tommy Lee Jones, Paul Schrader, Heywood Gould & others), Paul Schrader had originally intended a much less sentimental picture than what was finally made. He had apparently spent some time with Sam Peckinpah at one point and saw this script as his take on a WILD BUNCH kind of film. Some of that is still there obviously, however, it seems Heywood Gould's rewrites would seem to have softened the story a little bit in some parts and hardened it in others. I think the film benefits a bit from the sentimentality, which makes it more resonant. One of my favorite lines ever from Tommy Lee Jones in anything is "I'll just get my gear." It says quite a lot without saying all that much. Lee Jones and William Devane are both excellent here and they convey a lot with a certain stoicism. Apparently this was one of the very early "Vietnam Vets coming home" movies made, which was a bit of a bi deal at the time. One can certainly see a bit of a parallel between these soldiers struggling to fit back into their everyday "normal" lives and the soldier that say Jeremy Renner plays in recent film THE HURT LOCKER. Different war, similar trauma. This Shout Factory Blu-ray is another in a long line of wonderful genre film releases from them. The transfer has some grain to it, but it looks good. The disc isn't stacked with extras, but the aforementioned 'Making of ROLLING THUNDER' Featurette(about 22 mins) is a nice reflection on the film from most the principal players involved. I'm a big William Devane fan so it was really neat to see him in the present day talking about the film. It's also always interesting for me to hear what different writers bring to a given film. Here, Paul Schrader is credited with the story and gets a co-screenwriter credit with Heywood Gould. As I mentioned earlier, in hearing from both writers in this piece, one gets a better sense of the kinds of things that each brought to the final film we now know and love. Paul Schrader certainly brought the structure for the most part, and I would imagine the climax(which is somewhat reminiscent of TAXI DRIVER), while Gould brought in more of a sympathetic edge along with some gritty-ness. 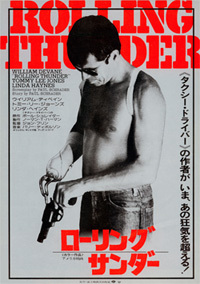 ROLLING THUNDER as a film, certainly benefits from both. It would have been nice to have heard from director John Flynn(who I am certainly a fan of), but as he sadly passed away in 2007 that was not to be. Sterling review of a powerful movie, and I totally agree with your take on QT being non-ironic. TRUE ROMANCE really is a very pure love story. That's its enduring appeal. Phantom- thanks very much for the kind words! Yeah I know I myself used to think if QT as more ironic in his take, but after hearing that great TRUE ROMANCE commentary track, it kind of shifted the way I look at his films.